Dec. 11, 2018 – Sitting side by side at the John Deere demo site in Illinois, the brand-new 748L-II grapple skidder and its predecessor, the 748L, are nearly identical. 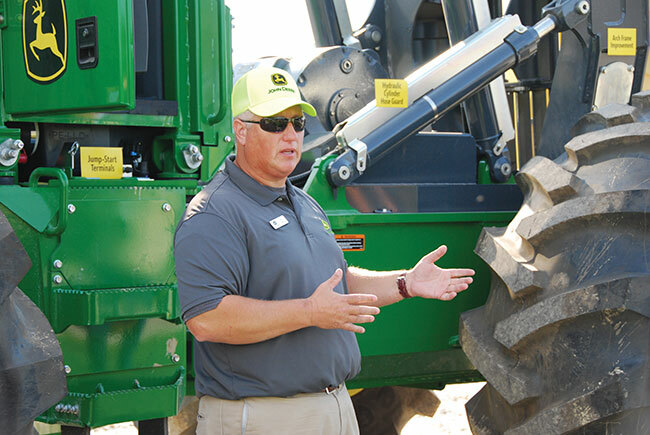 Brandon O’Neal, John Deere’s product marketing manager for full tree forestry, chuckles when he says from the outside the machines are not all that different. But a closer look at the interior reveals the three years of product development that went into the L-II models. Simplified wiring harnesses, increased grapple squeeze, colour-coded components and a soft steering stop are just a few of the 1,600 parts that were touched in the redesign to simplify the machine’s diagnostics and serviceability. “In the last three years we’ve continually improved this machine to meet customer demands,” O’Neal says. To mark the launch of their L-II series, John Deere invited media on a two-day tour of their demo site in Coal Valley, Ill., global headquarters in Moline, Ill., as well as one of their production facilities in Davenport, Iowa. Moline and Davenport are two of the four Quad Cities that straddle the Mississippi River and the border between Illinois and Iowa. The impressive John Deere headquarters was built in the 1960s on a 1,300-acre property. The building’s structure is fabricated from U.S.-manufactured Cor-Ten steel that creates its own rust-coloured coating, which acts as a natural barrier against erosion. Affectionately known as the “Rusty Palace” by staff, the building houses a large corporate art collection from around the world, which is overseen by the company’s art curator. At the Davenport Works factory in nearby Iowa, we walked the forestry production line to get a closer look at the simplified inner workings of the L-II series. The new wiring and component locations make it easier for both installation in the factory and service in the field. The factory produces, on average, six machines a day, each of which takes approximately three weeks to complete. All components, from the engine to the cab, are designed and manufactured by John Deere in house. 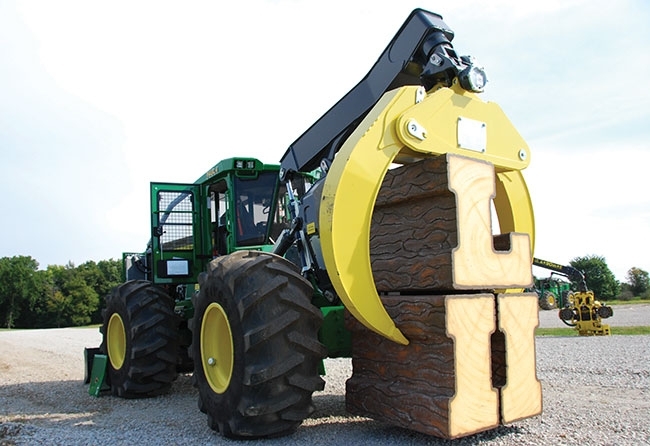 The original L-series skidder and wheeled feller buncher launched in 2015 as a ground-up redesign of John Deere’s forestry machines. The models were roomier, quieter, and more powerful than ever before. In the L-II redesign, the goal was to improve the machine’s reliability, building on the original platform, O’Neal explains. “Small improvements like colour coding components are made to make serviceability easier in the field and reduce downtime for customers,” he says. Tim Flowers, product instructional specialist for John Deere’s skidder group, narrowed in on the small details that make the L-II skidder model a big improvement over its predecessor. “A lot of them are internal – you won’t see a lot of changes on the external components and on the framework,” he says. Soft steering stop to reduce jarring when the machine reaches full articulation. This can be calibrated according to tire size. 10 per cent increase in grapple squeeze. A two-speed 4000 series winch. but major upgrades are found in the machine’s interior. John Deere also introduced new technology solutions for its wheeled cut-to-length equipment: the TimberMatic Maps and TimberManager. Both programs come standard on G-series harvesters and forwarders rolling out of the factory as of Sept. 1. Product manager Matthew Flood says the evolution of technology has reduced the effect of OEMs producing bigger, stronger and faster machines – the “old” strategy of improving production. Now, he says, the goal is easier, smarter and more precise machines. TimberMaticMaps and TimberManager is an important step for John Deere towards that goal, he says. TimberMatic Maps is a cloud-based system that connects all machines on site to upload and view real-time production data, which is collected by sensors on the harvesters as well as GPS data. The program collects information on location, volume and species of timber, as well as logging routes. TimberManager works in conjunction with TimberMatic Maps, giving the site managers access to all information necessary to follow worksite progress and streamline communication when shift planning. Flood says the programs are the next generation of the industry. “This will be the foundation for all machines, including full-tree machines,” he says. Both programs are under development for John Deere’s full-tree equipment line up, with rollout expected sometime next year. John Deere’s cut-to-length machines are built at their factory in Joensuu, Finland, a result of the company’s acquisition of Timberjack in December 1999.